There are dinners where you just sit down and eat. And then there is Cuisson, a truly collaborative night to enjoy both with friends and on your own, joining the outstanding team of chefs in their celebration of foodie greatness. Bespoke dining company Cuisson are offering the ultimate foodie fesst at The Vaults in Waterloo. Cuisson’s POPdown is a truly memorable experience, perfect for encouraging everyone to join in and assist with creating an incredible meal. Set in the Vaults’ understated, gritty and unique space, POP Down sees guests go through an art gallery and a bar with decor including mismatched chairs, potted wine gums and jellied mushrooms. The knowledgeable bar staff will recommend you the best options for wines and cocktails, set to keep you happy whether you like sweet or sour drinks. I went for the Cherry Pie drink, with lime, cherry liqueur and tequila. From the first welcome cocktail to the incredible dessert, everything at this innovative supper club screams “collaboration”. The team of four incredibly friendly chefs from four different countries and experiences across London’s best restaurants stands in front of you, ready to answer questions about their food and to get you involved in the cooking process. 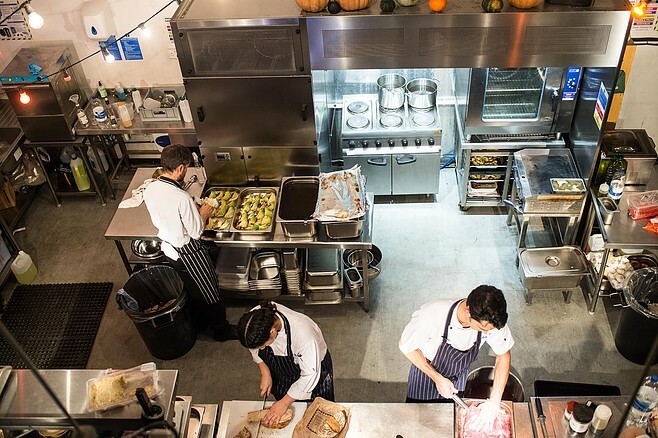 All plates are set on a big iron table right in front of the dining area, creating an exciting back-and-forth between the guests and the chefs, who encourage you to get behind the counter with them to whip up some of London’s finest dishes. Guests can enjoy four courses of innovative Cuisson cuisine and are clued up about what they’re eating from the word go. An incredibly thorough explanation of the cooking and fermenting process is written up right behind the main menu, which varies every night. My evening started with home-made bread and butter from the kitchen, good as only real bread made with love can be. But the real feasts began with a truly Christmassy dish, the Brussels sprout, chestnut mushrooms and clementine grains starter set to get everyone in the mood for Christmas. The first main consisted of the tenderest salmon you will ever taste accompanied by juniper, finger lime, kohlarbi and nasturtium. Then came the perfect brisket, blending a salty and spicy after-taste with everything that’s good about this dish, served with a side of fermented vegetables and made even better by a “beef tea” gravy. The meal ended in style with a dark chocolate ganache, baked pears and olive oil cake. It’s not easy to pick a favourite among London’s myriad of events, but Cuisson definitely comes in my top dinners this year. I loved being able to change seats, speak to everyone out there and get involved with the cooking. Everyone is truly knowledgeable and passionate about what they’re doing. The chefs looked fun, friendly and approachable rather than like an exclusive clique you won’t ever get access to. And, of course, the food was marvellous. So book your Cuisson night before it’s too late!